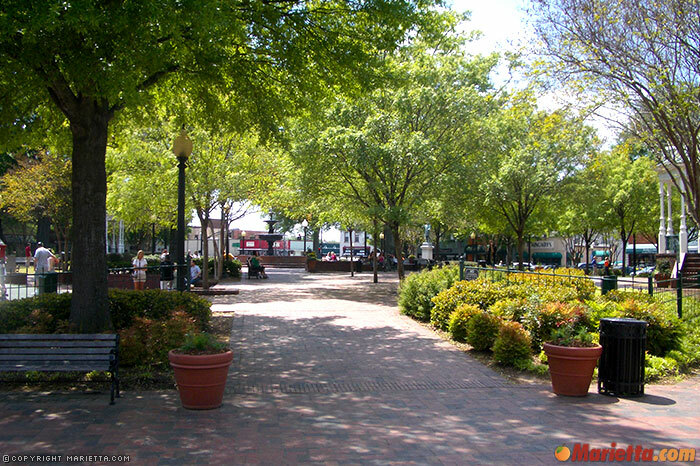 Surrounding the park, and a wide array of shops awaits you. 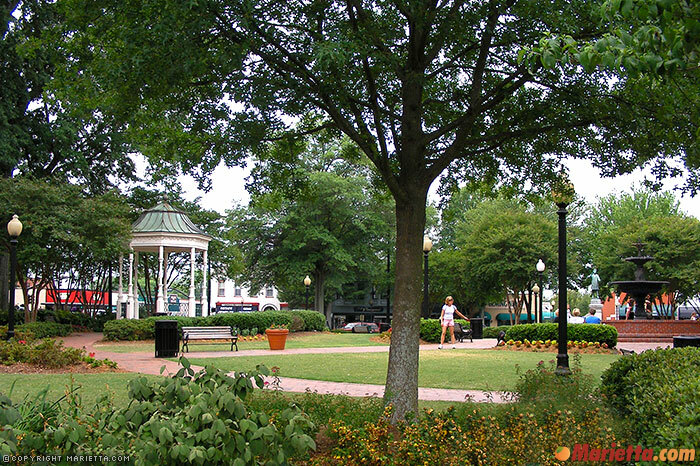 Unique gift shops, boutiques, antique shops, ice cream and candy stores, and a Brumby Rocker store dot the square. 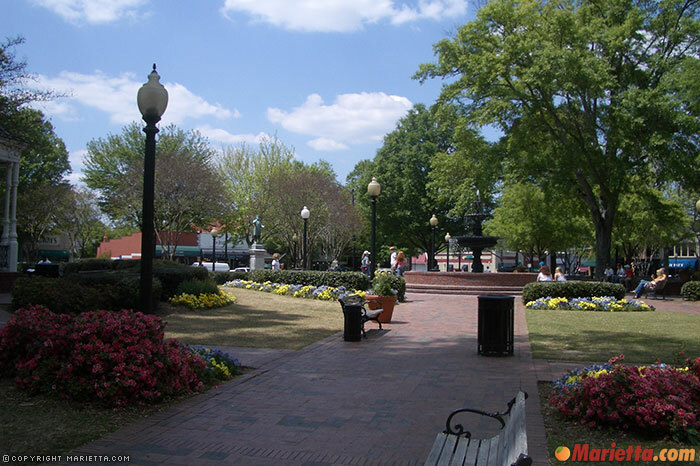 With over thirty Marietta Square restaurants in the area — ranging from traditional American and Southwestern fare to BBQ, Australian, Thai, Vietnamese, Colombian, Greek, French, Italian and Mediterranean cuisine – an eclectic mix tempts your taste buds. 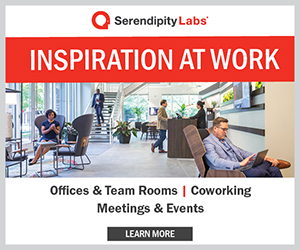 Desserts, bakery items, pizza, a brewery, and “spirits” also are within easy reach. Many establishments have outdoor seating, so you can people-watch while you enjoy your meal. If you are interested in the area’s history, visit the Marietta Museum of History in the historic Kennesaw House near the train tracks (next to the Welcome Center). The museum holds collections of photographs, artifacts and information about Marietta and North Georgia. Word is this building, which once served as a hospital and morgue during the Civil War, may be haunted by as many as 700 ghosts. 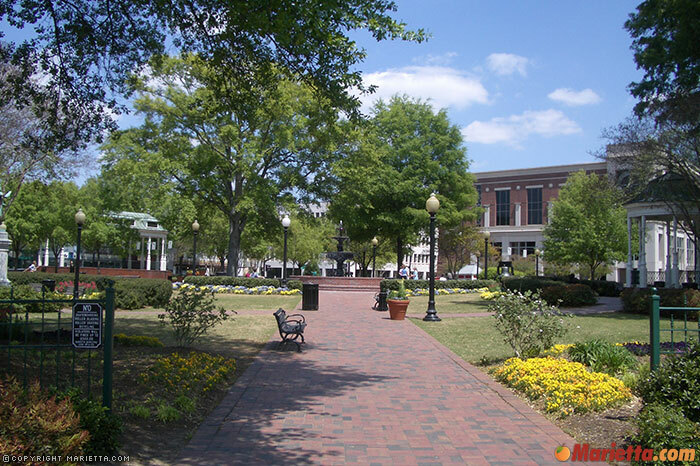 Walking tours can guide you through the Square’s history, too. You can find a walking tour itinerary at the Welcome Center. If food is what you are after, check out the tasting tour. If your tastes run to the “spooky” side, you could sign up for a Ghosts of Marietta tour. 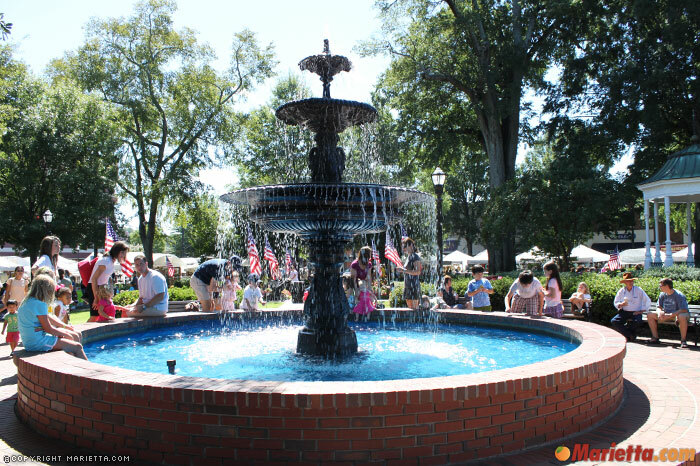 The Marietta Square Farmers Market is held every Saturday morning—rain or shine—from 9 am to noon year round, and on Sundays from 12-3 pm from April through November. 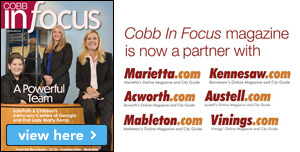 For more information, please call (770) 499-9393. How to find the Square? 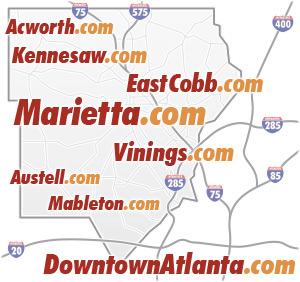 If you’re coming from Atlanta, take I-75 north to exit 263, which is South Marietta Parkway 120. At the exit, turn left and go west about five miles. Turn right onto Atlanta Street, and the Square is two blocks ahead. If you’re coming from North Georgia, take I-75 South to exit 265, which is North Marietta Parkway 120. At the exit, turn right and go west about two miles. Turn left onto Church Street, and the Square is two blocks ahead. 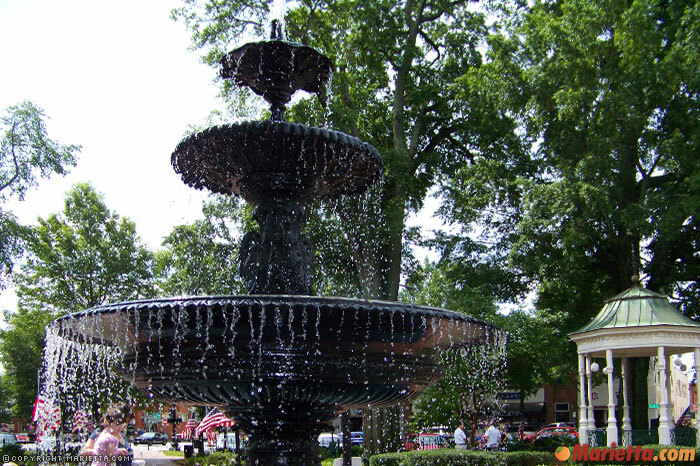 Created by Robinson Iron, the fountain in Marietta Square is 13 feet tall and weighs 3,500 lbs. The top bowl is 2’4″ in diameter, the middle bowl is 4′, and the bottom bowl is 7′ wide. The fountain and surrounding base hold about 350 gallons of water. 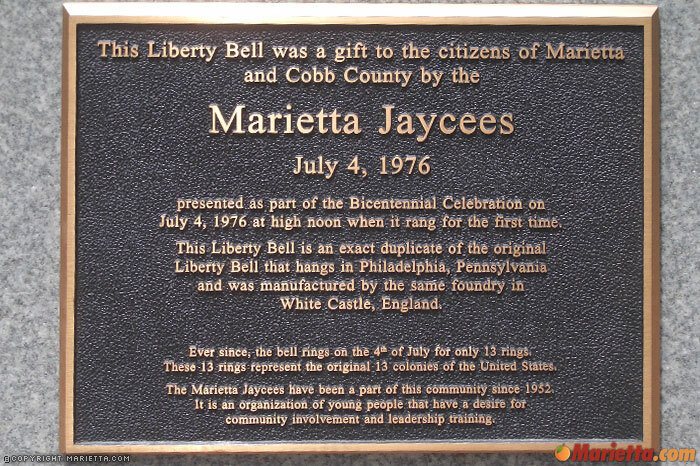 This Liberty Bell was a gift to the citizens of Marietta and Cobb County by the Marietta Jaycees on July 4, 1976. 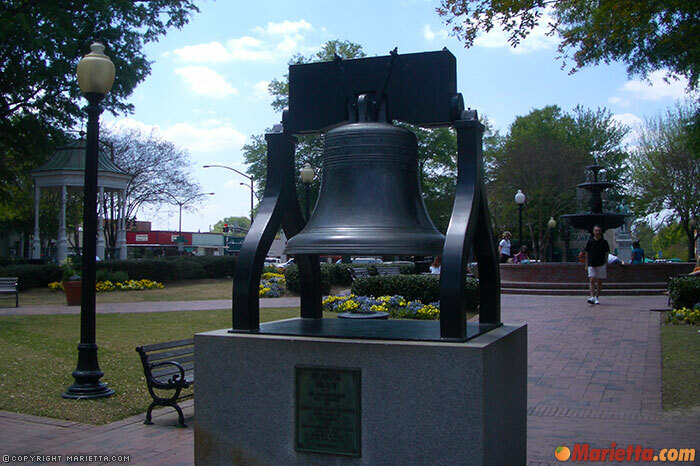 It was presented as part of the Bicentennial Celebration and is an exact duplicate of the original Liberty Bell in Philadelphia, manufactured by the same foundry in England.